Thursday 17 January, Nevis day 9: Check out formalities, battery hunt for bank token, and the disappearing of the data card. Of course it’s clear sky and bright sunshine today, we don’t rent a car and we don’t need to go anywhere! 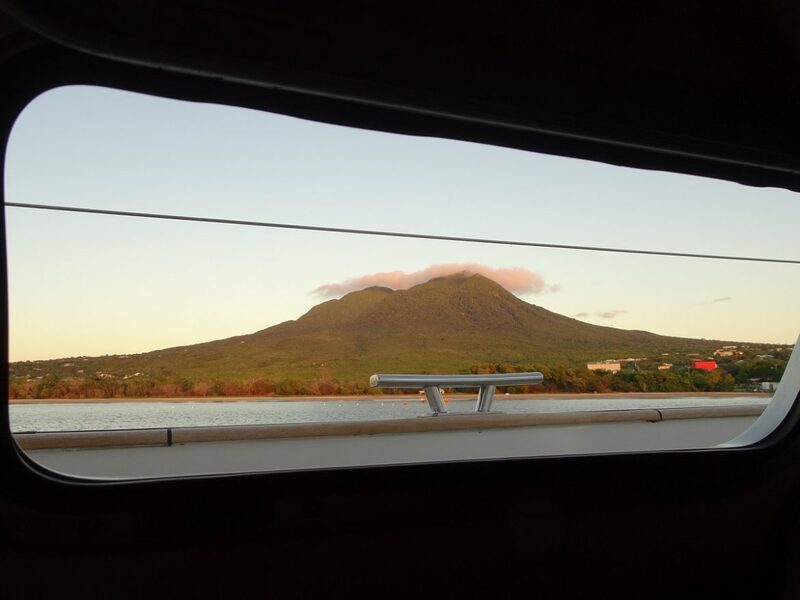 We can even see the volcano peak on St.Kitts today – it’s a conspiracy! It’s our last day in Nevis, so after we return the hire car we go to the customs and immigration offices for check out formalities. It is relatively quick procedure, all on the computer, with very friendly staff. From the Port Authority Officer we learn that cars were introduced to Nevis in the ‘80, before then transportation was by donkeys only. No wonder they still have so many donkeys on the island, all wild and free. After that we take our last videos of Charlestown and head for a coffee at Cafe des Arts. There we have a nice chat with the owner, who moved to Nevis 16 years ago. And when we mention to her that we love this island for how friendly the locals are, she replies with a blunt “only if you are here short term. Once you settle in, it all changes. I don’t hire locals.” We are very surprised with her statement, especially coming from a Brit. 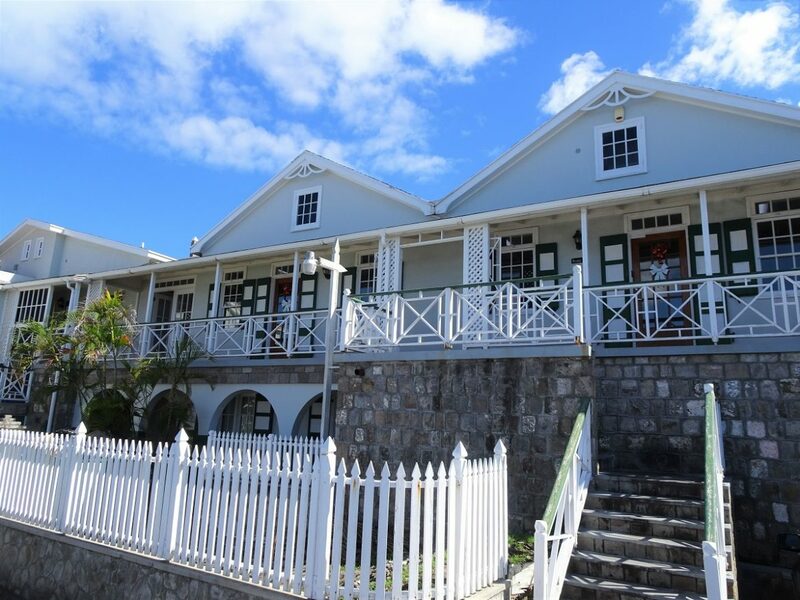 We also meet the owner of The Hermitage (the 16th century plantation turned into an inn). He moved here 50 years ago, bought the plantation from the original owners who had it for 300 years, cleared the jungle from around the ruins and started the renovation process. What a job he undertook! And now he is doing a pro-bono job, managing the restoration of an old house which is part of the Hamilton Museum. We return to Cloudy Bay for a relaxing day before our departure tomorrow, and I want to carry on with the editing of Nevis videos to bring it up to date. When I remove the memory card from the GoPro, it somehow flies out and I didn’t see where it landed. So instead of relaxing, we go on a manic mission to find the little damned card, which can be anywhere. We look under carpets, around the edges of the floorboards with the endoscope, under the settee… but the little sim is not to be found. How annoying is that!? We search for well over an hour and even try a demonstration of just how far these little devils can actually fly when released from the GoPro. The first one shoots right across the saloon and the next bounces off the ceiling. So it could literally be anywhere in the saloon. Luckily, last evening I downloaded the footage so previous days are safe on the laptop. But today’s videos are gone :(. No doubt we will find it, one day in the future. At least Glen’s tool box (one of his many, I might add!) gets a thorough cleaning because of this. We thought it might have got in there and when all tools are laid out it was clear a good cleaning was in order. Brilliant, that kept him busy for another hour! Later in the afternoon Glen tried to go online to do some banking but finds his small bank security machine “low on battery”. Inside we find not 1 but 4 tiny watch batteries of a number we’ve never seen before. So we dinghy into town to buy some replacements. Ha, how hopeful are we? Where on Nevis could you possibly find specialist watch batteries? Well, the answer lies in one of the several Chinese shops that are all in a row next to each other, all selling the same Chinese type “stuff”. Amazingly a Chinese boy pulls out an unopened box which must contain at least 200 of the very batteries we need. Incredible eh? Back at Cloudy the banking is completed and we have a quiet evening getting ready for tomorrow’s sail to St.Barts. 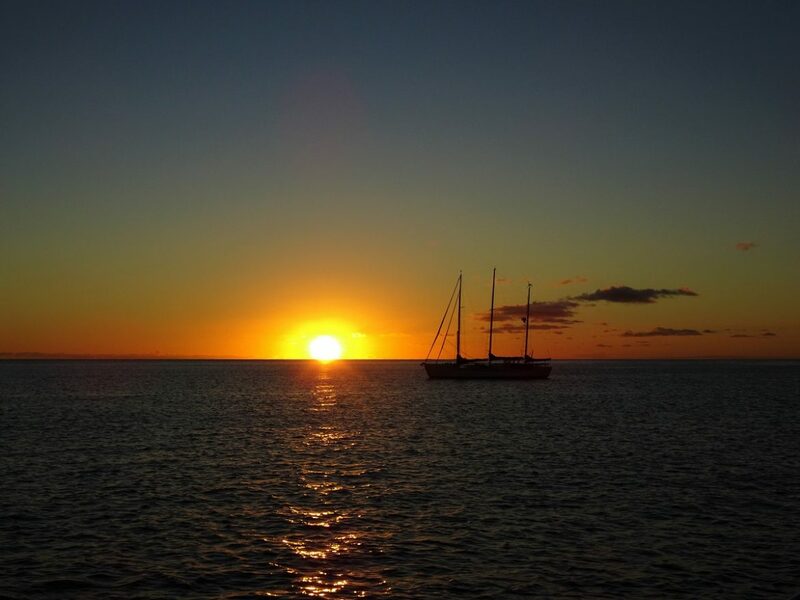 And we have a lovely last sunset in Nevis, with beautiful orange horizon. We will be sad to leave Nevis. We have been really taken in by this beautiful little island. So interesting, so clean, so green, so welcoming and so many surprises around each corner it seemed. Beautiful beaches, lovely town, hot springs, great trekking, rainforest, restored and unrestored plantations, the history of Nelson and his bride Fanny, great places to eat and drink and above all such genuinely pleasant people live here, both expats and locals. Our best Caribbean island to date.